Would you like to be happier at work? Would you like to go home at the end of the day feeling good about yourself, like you’ve accomplished something? This book is not about how to find your dream job. It’s about how to transform yourself at work so that you are proud of what you do, excited to go to work on Monday morning, and feel good at the end of the day, every day. 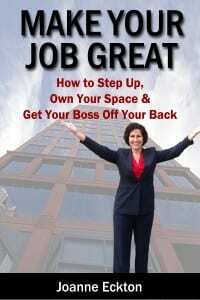 Revitalize, embolden and empower yourself to take charge of your professional life. Let’s get started! Set aside time everyday to write, and write about what comes to you that day. You can always rearrange the sequence later. Joanne is a widely recognized expert in aligning teams to perform with purpose. She believes that small and medium sized businesses are the true backbone of our economy and the hope for our future. She brings the knowledge and skills that help business owners implement simple but time-tested strategies to get results faster and more efficiently. Joanne has honed her skills in Fortune 500 companies such as Verizon and IBM, where she led large projects with team members from all around the world, steering them through the process from project initiation through completion. There are so many people miserable in their jobs and I want to reach as many as I can with advice on how they can feel good about themselves and the work they do.